When you think of outdoor projects, what immediately comes to mind is all of that maintenance stuff like lawn care, power washing the deck, or fixing the broken fence. That is NOT what this post is about! It is all about the fun and creative side of things, like building outdoor furniture and accessories. I don’t know about you, but I love to decorate the outside just as much ….almost….as the inside of the house. 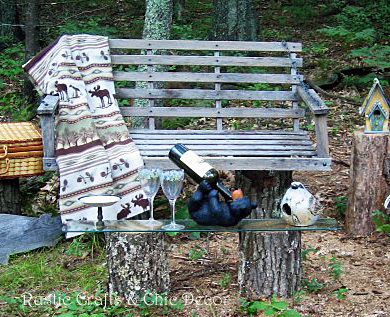 These DIY outdoor projects are sure to enhance your outdoor spaces. Whether you want to decorate a porch, deck, or the entire backyard, there are so many creative ideas to make your spaces comfortable and welcoming. We had picked up this great vintage swing at an antique store. Instead of hanging it somewhere, we decided to simply screw it to a couple of large logs that were cut nice and level. We then made a quick coffee table with another couple of logs and a leftover piece of tempered glass from our deck rail. You really can’t get much easier than that for a DIY project! This one from Funky Junk Interiors takes a little more effort but is not bad at all and can be practically free. 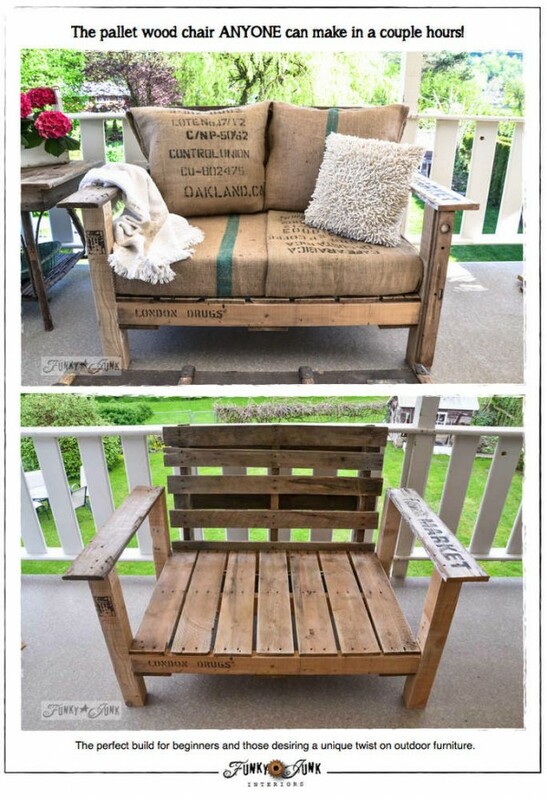 It is made from pallets so how cool is that? The nice part is that using pallets makes it easier to make than what it looks. I am also loving the vintage grain sack cushions which go perfectly with the pallet wood. This next project, by Twig and Toadstool, is so so adorable! It’s another project using logs and……old wooden salad bowls – I love that! 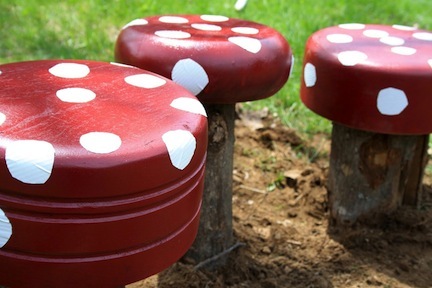 Now I want to make a sitting area full of mushroom stools. 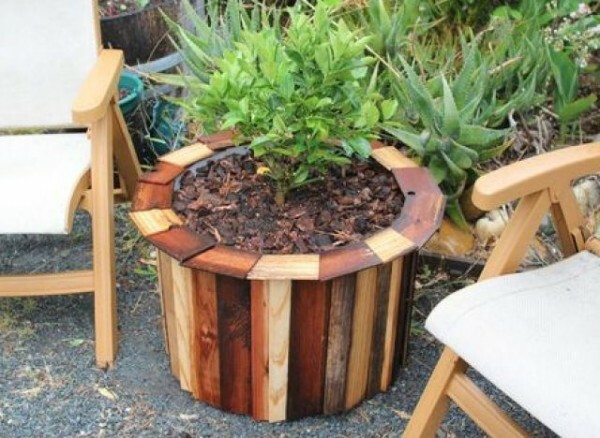 I love this gorgeous multi colored wood planter that is actually made from a plastic barrel. More upcycling here! The barrel gives a great base to work from making this another project that is easy to do. I know that I am a little bit biased when it comes to making things with logs and branches…….I just can’t stop myself! 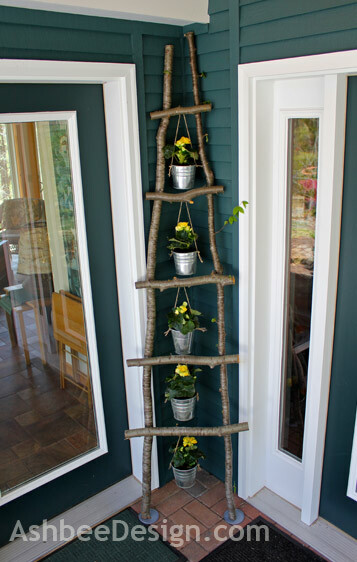 But, I just love this idea by Ashbee Design for making a branch ladder to hang potted flowers from. Is there really a better way to decorate a corner space like that? I think not! 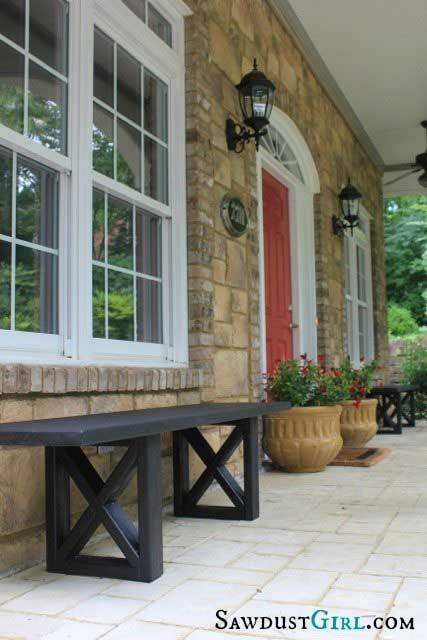 I love the idea of adding a bench to a front porch space, especially one that can be made so simply! Not only does the bench look great on it’s own but it make a fantastic stage for more decor. Think decorative pillows, flower pots, or other items that can be switched out for the various seasons and holidays. Make sure to check out the tutorial for the easy to follow and very detailed construction steps. Do you have any DIY outdoor projects in mind for this year?